Let’s use Valentine’s Day to teach kids about God’s Love! Here are some of the best resources to encourage children to love Jesus most of all. Listed below you will find crafts, lessons, and bonus ideas to make the most of this February. Bible Lesson About Love (1 Corinthians 13) for Children – In this lesson, kids will learn God’s definition of love and be reminded of the character of Christ. 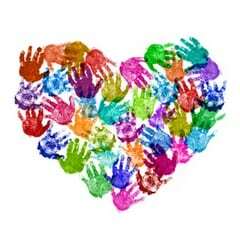 Jesus Said Love Your Neighbors Lesson Plan – The second greatest commandment in the Bible, and something timely to teach in Sunday School for Valentine’s Day. Jesus Said Love Your Enemies Lesson Plan (Matthew 5:38-48 ) – Kids will learn about Jesus’ parable of the Good Samaritan and what it teaches us about loving other people who are not like us. God Looks at the Heart Lesson (from 1 Samuel 16:1-13) – What matters to God is on the inside. Use this lesson plan to remind children of that important truth. Printable Booklet – Who do I love? Who loves me? 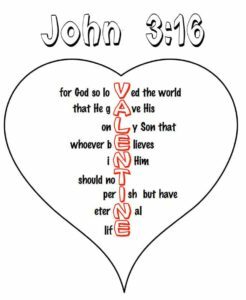 Printable John 3:16 Heart – A clever way to remind kids that the greatest love is really the love that God displays for sinners through the Gospel. 1 Corinthians 13 “Love is…” coloring sheet – Designed to help kids think about the Bible’s definition of love. 3 Valentine’s Crafts for Sunday School – Watch these video demonstrations from Cullen and you’ll be ready to use them in your class this weekend. Heart Craft for Sunday School – Watch a video demonstration of this simple craft project that could accompany any of these Bible lessons about love. Here are a few more game ideas for Valentine’s Day in children’s church. In just a few weeks, Valentines Day will be here. Many Sunday School teachers and children’s church leaders will plan a special lesson around the date. So I went through our content to pull out some lesson plans and crafts that might be helpful to your church. These materials try to redirect the cultural obsession with romance back to the love that should characterize the Christian life. I hope these Valentine’s Day Lesson Plans will be helpful to you. That’s wonderful, exactly what am looking for. God richly bless you.